Bizarre Baseball Culture: The Detroit Tigers, A Talking Tiger, and the Power of SHAZAM! Nothing is going to beat Mr. Go. It just can’t be done. 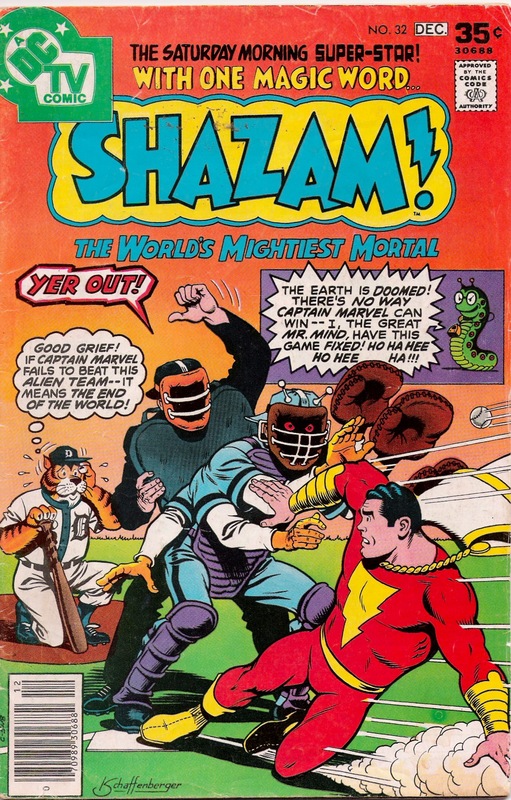 But, I’ll give it my best shot by bringing to you a comic from 1977 in which DC’s Captain Marvel and his talking anthropomorphic tiger mascot Tawky Tawny join the Detroit Tigers to defeat a team of alien All-Stars. So, here’s Shazam! number 32, from late 1977. I covered most of Captain Marvel’s complicated history (and why most people think he’s called Shazam) way back in May 2012, so if you want to know that, go there. However, an update is in order: DC has more or less given up calling him “Captain Marvel” and now is referring to him as “Shazam”. This is partly because everyone who doesn’t read comic books calls him that anyway, and also partly because Marvel has recently given the title of “Captain Marvel” to a character named Carol Danvers (who appeared as “Ms. Marvel” back in one of the AAA baseball comics) to great success, to the point where it’s thought they might make a movie starring her, likely with the name “Captain Marvel”. 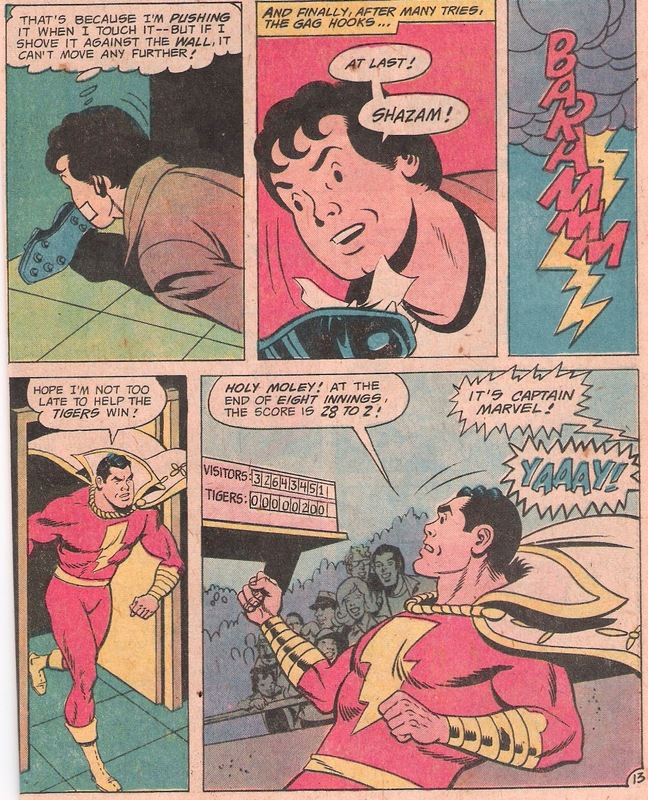 Personally, the Shazam Captain Marvel will always be the real Captain Marvel to me, but, hey, you can’t beat copyright/trademark law, I guess. But enough Captain Marvel background, go below the jump for an analysis/review of this comic! This comic is very much a product of it’s time, as it practically oozes 1970s. 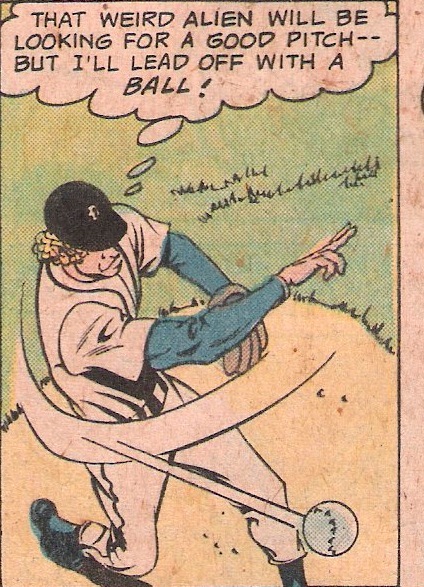 At the time, Captain Marvel had a TV show (although it had ended it’s original run and was just in reruns by the time this comic came out) and the Tigers were just a year removed from the mania of Mark “The Bird” Fidrych, who appears unnamed but unquestionably recognizable in this comic. The Yankees, in the early days of the Steinbrenner era, also make a brief appearance. 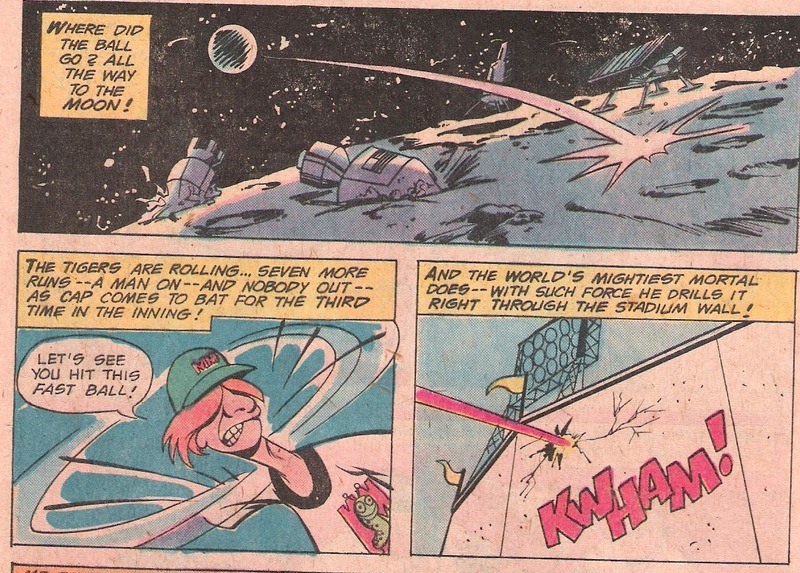 The comic is filled with ads for Hostess snacks, Saturday Morning TV and BB guns. And, in perhaps the biggest giveaway of the era, there’s a mention of a Welcome Back, Kotter comic on the announcement page at the end. Yes, the Sweathogs had their own comic book. 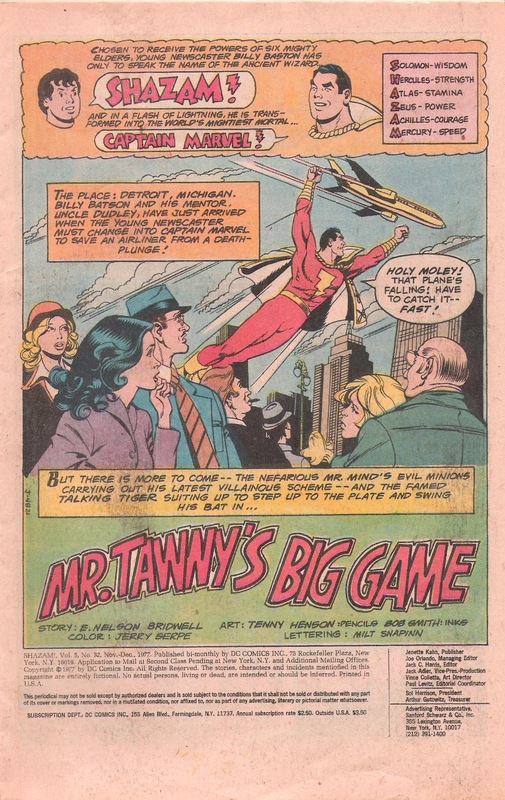 …Anyway, our story begins with Captain Marvel saving an airplane in Chicago. Note the misspelling of “Batson” as “Baston” at the top. But, wait! There’s a problem, the people in the back of the plane have disappeared! And they are supposed to play the Tigers that day! 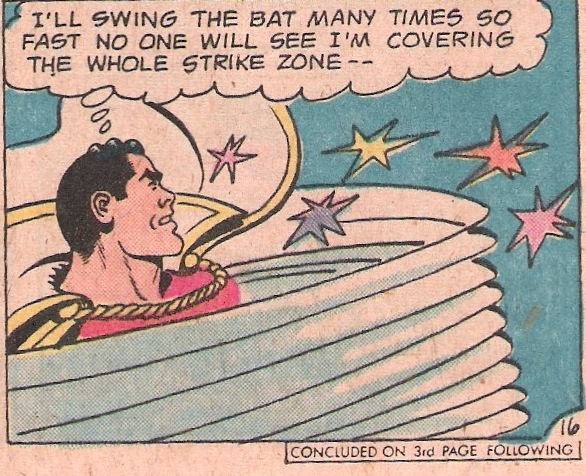 Oh, and Captain Marvel had left the scene without even checking to see if everything was okay. No, instead, he has to go to his van, which he drives around the country with his uncle Dudley, sponsored by broadcaster WHIZ. Can you imagine driving down the highway next to a van, and then Captain Marvel flies into it, and then there’s random lightning and all the sudden there is a kid in the van where Captain Marvel used to be? Because you have to figure that happened before the next scene, where Billy (wearing a getup that is almost as 70s as Welcome Back, Kotter comics) and Dudley meet up with Ivan Ludington (an actual guy who died in 2012) and Tawky Tawny. 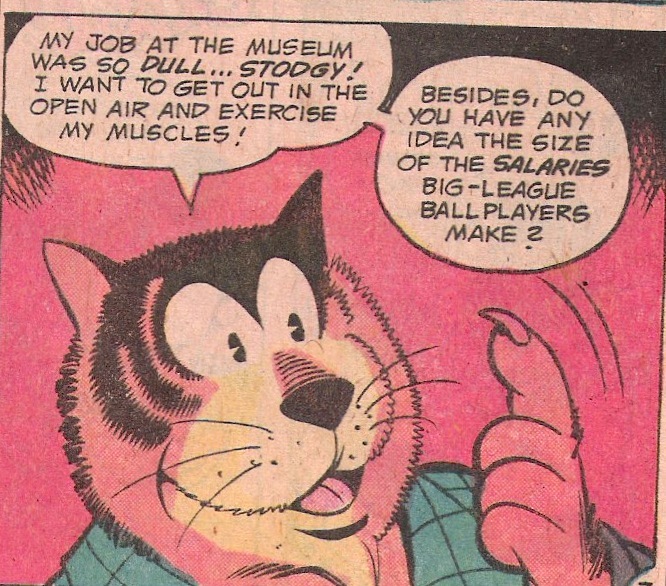 And before you ask, Tawky was created in 1947, a few years before our friend Tony the Tiger. 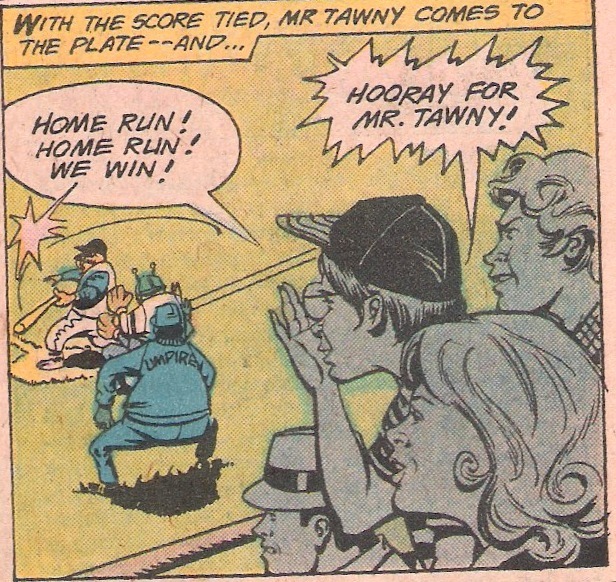 Tawny is there because he wants to try out for the Tigers, because, hey, why the hell not? He’s a real tiger, after all, they’d have to sign him. Also: Big salary. He’d get a big salary. On gameday, of course, something goes horribly wrong, as a voice echoes throughout the stadium… the voice of…. MR. MIND! One of Captain Marvel’s greatest threats! A scourge upon the Universe! The most diabolical thing in the inner solar system! 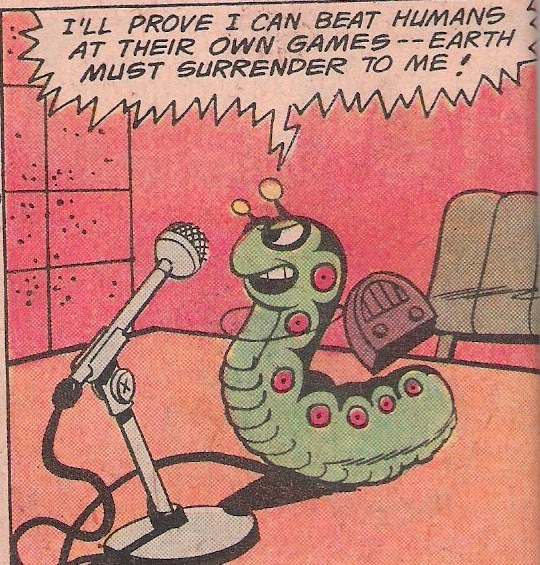 Okay, so he’s a caterpillar-worm-thing from Venus. But, wait! Wait! Don’t laugh, that little Venusian worm has grand mental powers and is a super-genius! And presumably he’s really, really heat-resistant too, seeing as how he’s from Venus, the closest thing in the Solar System to hell itself. So, Mr. Mind says, he’s kidnapped the opposing MLB team and has sent in a team to challenge the Tigers in their place, with the FATE OF THE EARTH at stake. And he’s brought a All-Star team of Extraterrestrials to challenge them! 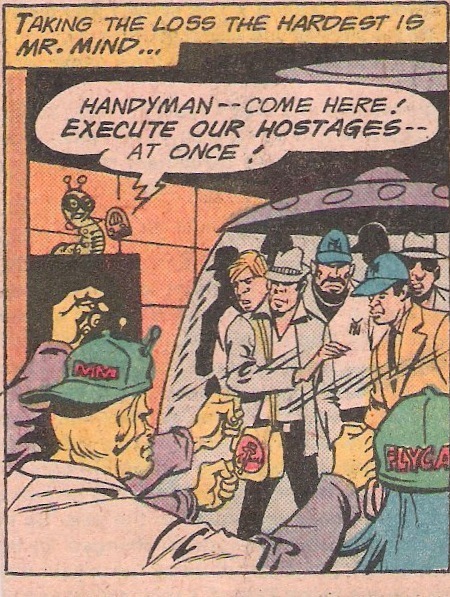 I have to say, seeing as how the story’s writer, E. Nelson Bridwell, is noted on Wikipedia as being a “Continuity Cop”, that I am disappointed at the lack of the Martians from that 1943 comic. Oh well. Also, I’m pretty sure some of the things the aliens do in this comic are against baseball rules, but, well, this is a comic featuring a talking tiger and a kid who becomes a superhero by saying a magic word, so maybe I should be quiet. Anyway, Captain Marvel is having one of this, and soon has gotten a spot on the team. Mr. 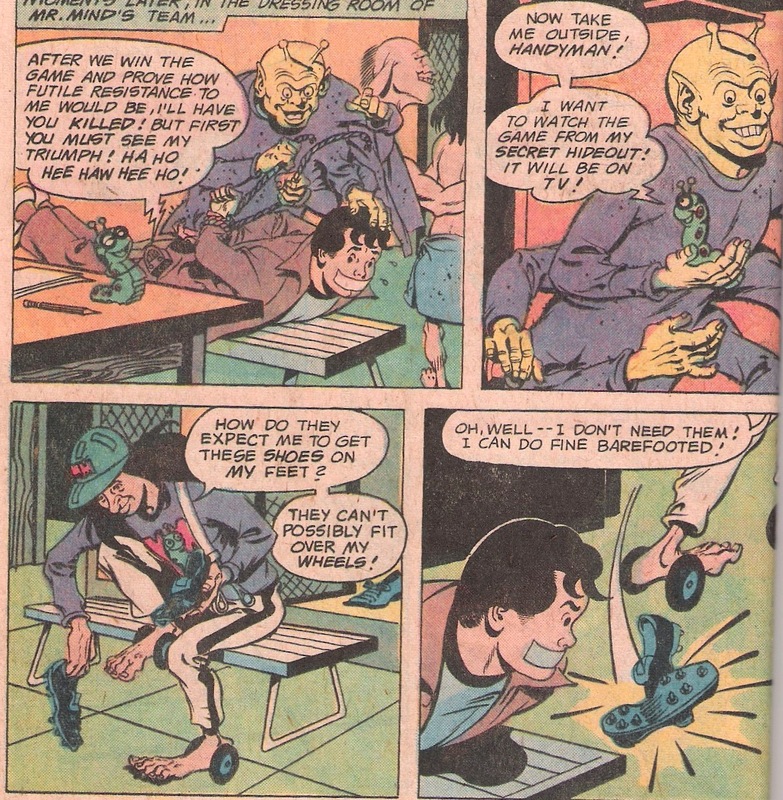 Mind is having none of it, however, so, while Billy Batson takes a break to call in the news about how Captain Marvel is going to have a game against aliens, Mr. Mind’s all-stars kidnap him. Thankfully, one of the aliens doesn’t want to use cleats, thus providing us a possible get-out-of-jail device… eventually. 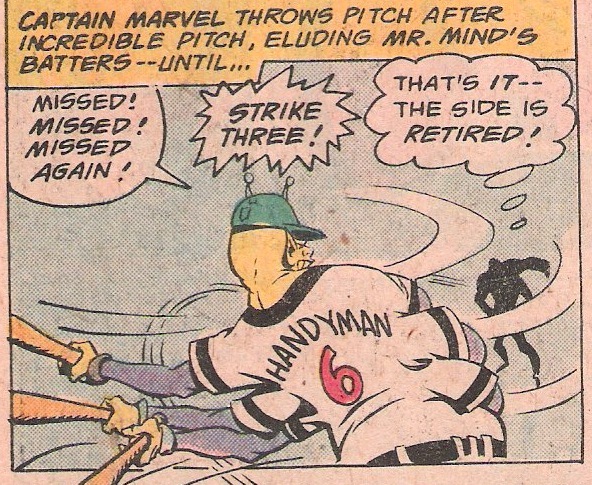 Of course, now it’s time for Captain Marvel to rejoin the game, as, after 8 innings, Billy finally breaks loose from his gag and SHAZAMs back into Captain Marvel…. to find that the Tigers are down 28-2. And then, well, Mr. Mind reveals he was a hologram the whole time and that he’ll see Captain Marvel at the Indianapolis 500 (which was the next issue), and Tawny says that he can’t take the pressure of playing for the Tigers everyday, leading to a bad joke about how he can’t play football either because he could never be a Lion (since he’s a tiger). Well… that was…. weird. 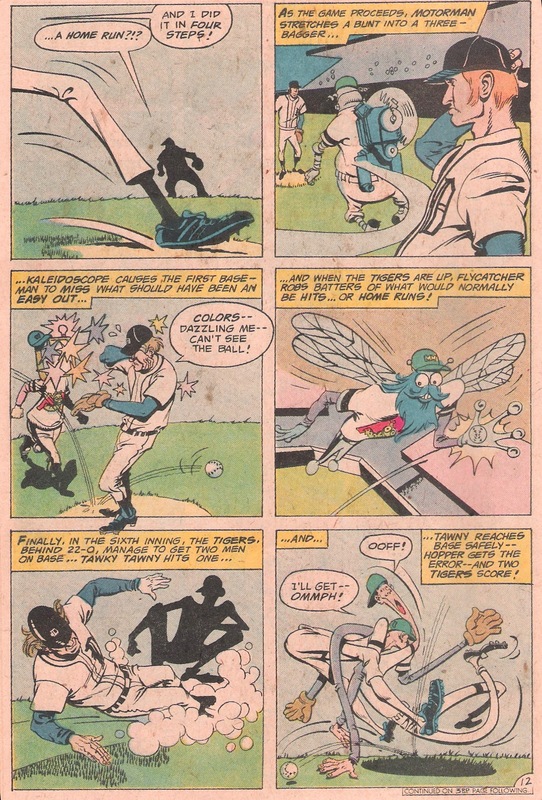 Like many of the Bizarre Baseball Culture comics, this followed a relatively basic plot: villains mess up a game, capture (or otherwise occupy) the hero, hero arrives at last minute and stages big comeback .However, what’s weird about this one is that it has an actual team in it (the Tigers and, briefly, the Yankees) and some actual people in it. Oh, sure, you never see them named, but you can clearly see Mark Fidrych and his curly blond hair, you can clearly see Steinbrenner standing amongst the Yankees at the end, and a Detroit-area publisher even shows up named. While I didn’t see Ralph Houk or Jason Thompson anywhere, it doesn’t feel that much out of the realm of possibility that they were just off-page. And that elevates what is simply a strange comic into an outright weird one. Next Time on Bizarre Baseball Culture: Biography! 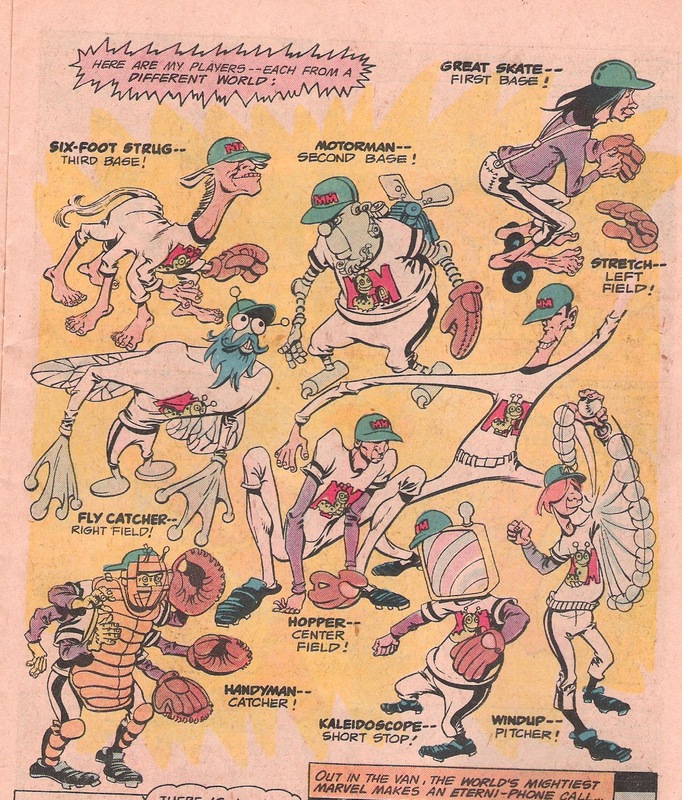 This entry was posted in Baseball, Books and all their spinoffs, MLB, Uncategorized and tagged 1977, Baseball comics, Bizarre Baseball Culture, Captain Marvel, comic book, comics, DC Comics, Detroit Tigers, SHAZAM by danglickman. Bookmark the permalink.